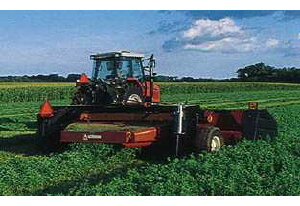 Mower conditioner (haybine)- These machines both mow the hay and crimp the hay stems to cut drying time.These mowers can move fairly quickly through the hay up to speeds of 4-6 MPH. Sicklebar mower- These are the older type of hay mowing machinery. They are very slow and do nothing to help the hay dry. Discbine-These machins are very efficient and they also both mow the hay and crimp the hay stems helping with the drying time. These machines can mow hay up to speeds of 10 MPH.